The computerized Newton SkyWatcher 200/1000 EQ5 telescope is the ideal instrument for starting to observe and learn about the sky. 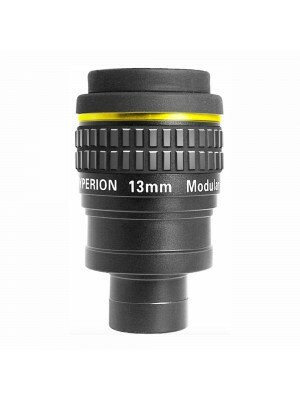 The Newton 200mm is very bright, ideal for deep sky observation and astrophotography. 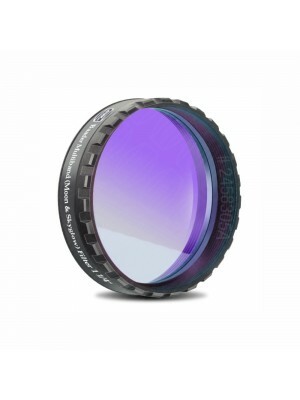 In a few minutes you will be able to start your observing session or photo very easily. It's a Computerized and motorized equatorial mount on both axes, ready for long exposure astrophotography. The integrated Synscan computer will guide you to the alignement procedure and a astronomy sky tour. 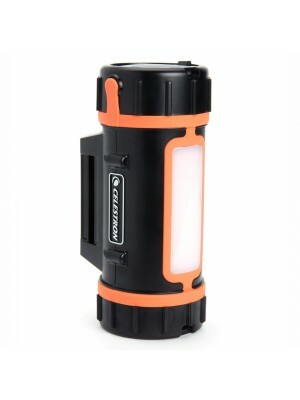 Extremely versatile but also highly portable you can take it anywhere searching for darkest skies. 3 years of warranty! 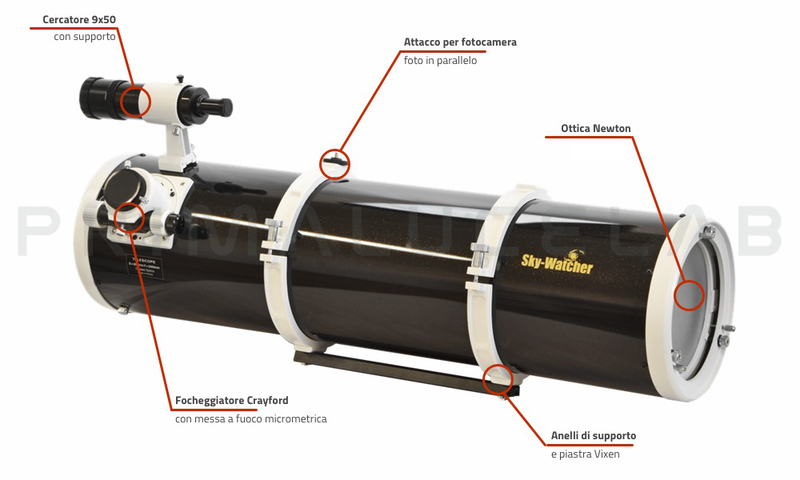 This telescope from Skywatcher is composed by a euatorial german mount EQ5 Synscan computerized and Newton optical tube 200mm in diameter and 1000mm focal length. 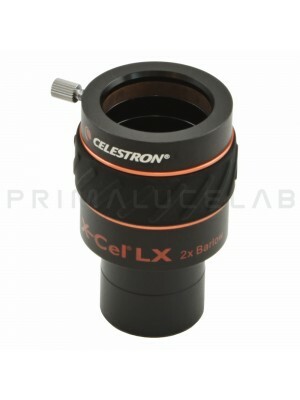 Ideal for those who want to do starting observations and approach in astrophotography. 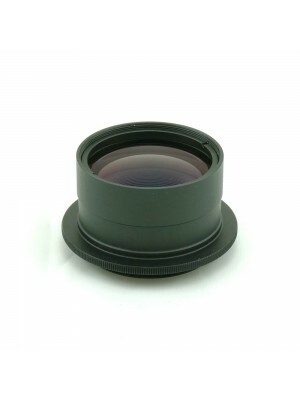 The optical tube is a Newton SkyWatcher 200/1000 f5 has a solid Crayford focuser 50.8 mm in diameter and 31.8 mm with a 1:10 fine focus gear, better than similar telescopes of other brands. 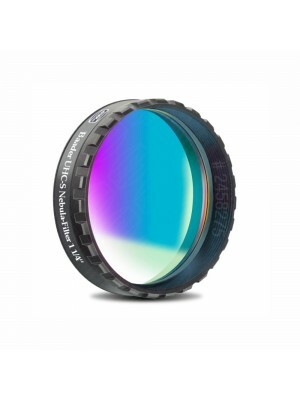 It allows you to use both eyepieces 31.8 mm or a wide-angle 50.8 mm in diameter (for low magnification and large framed fields) but also connecting a camera with large sensors (such as digital SLR): in this case we recommend the use the coma corrector for f5 telescopes that flattens the field. It comes standard with support rings and dovetail Vixen bar, along with an eyepece LET 28mm 50.8mm in diameter and the 9x50 finderscope. This equatorial mount is very compact and easy to carry around, is also very precise and versatile. It can be assembled and disassembled in a few minutes, ideal if you do itinerant observations. 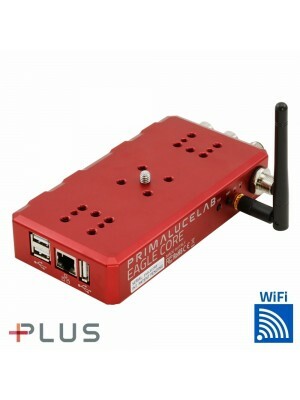 The load capacity is up to 10Kg, allows to installs optical tubes up to 200mm included accessories. The motors in both axes allows to point and track very precisely any object that you will choose to see, the guider port allows you to connect a guideing camera indispensable for deepsky photography. To align the mount to the Polar star it comes with a polar telescope, very important if you want to improve the tracking of objects. To facilitate the transport the head, the tripod and the optical tube can be separated. 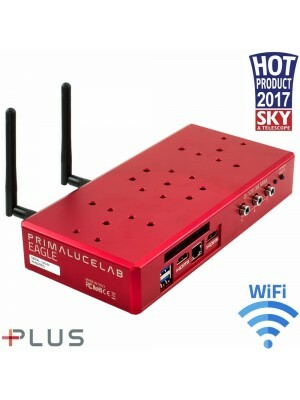 It is also possible to control the mount directly from the PC, just connect the cable supplied as standard and download one of numerous planetary software (such as Cartes du Ciel) and you will be able also to remotely control the mount. The same cable will allow you to update the firmware of the hand control unit and add more objects in the database. To speed up and improve the alignment procedure is avaible (optional) a GPS module, which automatically detects the date, time and the current position.